September may mean the end of the summer holidays and the return to the daily routine for most, but this is one of the best months of the year to visit the Amalfi Coast if you can squeeze in a final few days of R&R. The weather on the Amalfi Coast is still quite mild in September, with the temperatures slowly cooling off but still warm enough to swim in the sea. Beach clubs, restaurants, and hotels are all open until mid-October but much less crowded, and you can pack summer clothing along with a light jacket for the late summer showers and cooler evenings. 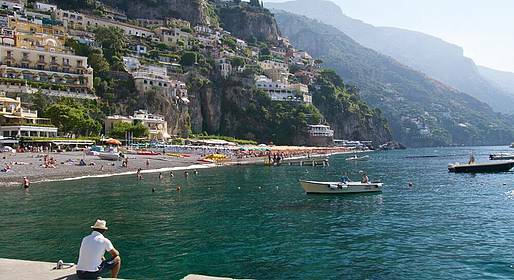 Beaches on the Amalfi Coast all face south, guaranteeing warm temperatures late into the fall. Unfortunately, the beaches are in the shade from the late afternoon, so the best time to head to the sun bed is early in the day. Schools in Italy reopen the second week of September, so the beaches and towns along the coast quiet down significantly in the later half of the month and you can enjoy relative peace and quiet. The water is perfect in September for a boat tour to Capri or along the Amalfi Coast. The water is much less crowded with boats and yachts after the high season months of July and August, so you'll have the coastal caves and coves virutually to yourself. You can also take advantage of lower prices for boat tours in the second half of September. The temperatures are mild enough in September to dine alfresco, and restaurant terraces are still open. Clubs and bars are open on the weekends, centered around the Spiaggia Grande beach in Positano. At the end of the month, you can dine on fresh fish at the “la festa del pesce” on the Fornillo beach in Positano, when the town celebrates the end of the tourist season with food stands and music right on the water's edge.